I'm attracted to this movie when I first saw the trailer. Base on the award-winning and best-selling 2002 novel of the same name by Alice Sebold, the story is about 14 year old girl name Susie Salmon. Like any other girl at her age, she dreams to be a wild life photographer and had a crush on her senior Ray Singh. But unlike other girls, her life end tragically, on December 6th 1973 when she was murdered and dismembered by her neighbor. As her life on earth ended, she not gone~ instead her spirit flees to her heaven, the perfect world for her. These were the lovely bones that had grown around my absence: the connections — sometimes tenuous, sometimes made at great cost, but often magnificent — that happened after I was gone. And I began to see things in a way that let me hold the world without me in it. The events my death brought were merely the bones of a body that would become whole at some unpredictable time in the future. The price of what I came to see as this miraculous lifeless body had been my life. 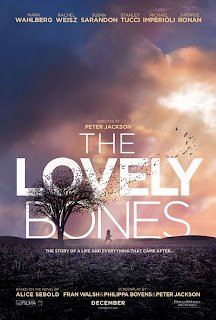 i want to watch lovely bones too. just wondering when will it shows here.